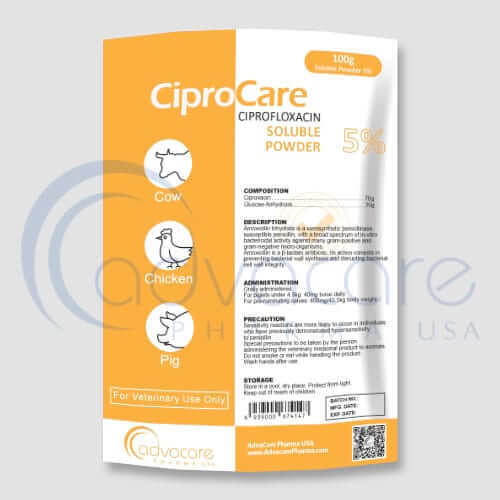 *AdvaCare Tilmicosin Soluble Powder is GMP certified. **AdvaCare Tilmicosin Soluble Powder is manufactured in our facilities located in China, India and USA. 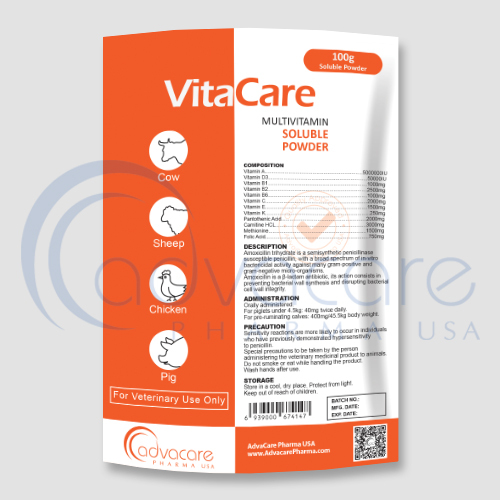 AdvaCare is a GMP manufacturer of Tilmicosin Soluble Powder. Soluble powders of tilmicosin is a macrolide antibiotic used for livestock and poultry. It is mainly used to control mycoplasma avian mastitis in lactating animals and to control pneumonia in livestock. Tilmicosin is used in the treatment of respiratory infections in cattle and sheep associated with Mannheimia haemolytica, Pasteurella spp. and other microorganisms sensitive to tilmicosin, as well as for the treatment of ovine mastitis associated with Staphylococcus aureus and Mycoplasma spp. 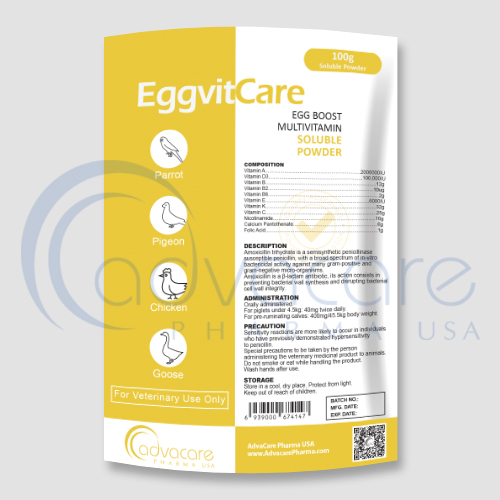 In addition, it is recommended for use in the treatment of interdigital necrobacillosis in cattle (bovine pododermatitis, fulling foot) and ovine foot rot. Tilmicosin is mainly excreted by bile in the faeces, a small part of which is excreted by the urine. As with all veterinary products, some side effects may occur. Always consult a veterinarian or animal care specialist for medical advice before use. Common side effects include: hypersensitivity, lameness, decreased food and water consumption, anaphylactic / anaphylactic reactions, dyspnea, death, etc. If any of the symptoms persist or worsen, or if you notice any other symptoms, seek veterinary medical treatment immediately. Always consult a veterinarian or animal care specialist before using Tilmicosin Soluble Powders. If the problem does not improve or worsen, call a veterinarian or animal care specialist. It is indicated in the treatment of mycoplasma infection caused by coughing, snoring, sneezing face gasping, swollen nose, breathing difficulties, open mouth and neck extension, caesarean section can be observed in the trachea inside the cheese-like substance and other symptoms. Oral absorption is rapid and has a lasting effect, the drug can reach the peak of drug concentration in the blood 2 to 3 hours after entering the body and drug concentration in the blood lasts a long time. The recommended overall dosage is as follows: mix 75 mg of tilmicosin with 1 liter of water and continue to use in the chicken for three days. Consult an animal care specialist for dosage instructions. Do not go over what they advise and complete the entire treatment, as stopping early can lead to recurrence or aggravate the problem. 14 days for the last treatment chicken. The soluble powder of tilmicosin is not intended for human consumption. Inhalation and skin contact should be avoided. Seek immediate medical attention in case of accidental consumption. Consult an animal care specialist for any other medication taken by the animal and its medical history before treatment with tilmicosin-soluble powders.